آزادفلاح, محمد, میرزازاد, فهیمه, همزه, یحیی. (1391). اثر بازیافت بر ویژگی های شیمیایی و استخوانی شدن خمیرکاغذهای CMP و NSSC. مجله صنایع چوب و کاغذ ایران, 3(1), 99-108. محمد آزادفلاح; فهیمه میرزازاد; یحیی همزه. "اثر بازیافت بر ویژگی های شیمیایی و استخوانی شدن خمیرکاغذهای CMP و NSSC". مجله صنایع چوب و کاغذ ایران, 3, 1, 1391, 99-108. آزادفلاح, محمد, میرزازاد, فهیمه, همزه, یحیی. (1391). 'اثر بازیافت بر ویژگی های شیمیایی و استخوانی شدن خمیرکاغذهای CMP و NSSC', مجله صنایع چوب و کاغذ ایران, 3(1), pp. 99-108. آزادفلاح, محمد, میرزازاد, فهیمه, همزه, یحیی. اثر بازیافت بر ویژگی های شیمیایی و استخوانی شدن خمیرکاغذهای CMP و NSSC. مجله صنایع چوب و کاغذ ایران, 1391; 3(1): 99-108. الیاف سلولزی هنگامی که در معرض چرخه‌های تر و خشک شدن قرار می‌‌گیرند، دستخوش تغییرات برگشت‌ناپذیری به عنوان استخوانی شدن بیان شوند. در این تحقیق تاثیر بازیافت بر ویژگی‏های شیمیایی و استخوانی شدن خمیر کاغذ های سولفیت خنثی نیمه‌شیمیایی (NSSC) و خمیر کاغذ شیمیایی- مکانیکی (CMP) ارزیابی شد. خمیرکاغذهای مورد نظر سه بار تحت فرآیند بازیافت قرار گرفتند، و پدیده استخوانی شدن در این خمیرکاغذها از راه اندازه‌گیری میزان ماندگاری آب تعیین شد. نتایج نشان داد که میزان ماندگاری آب و مقدار گروه های اسیدی با افزایش بارهای بازیافت، کاهش و استخوانی شدن با تکرار چرخه تر و خشک شدن، افزایش یافت. همچنین بررسی شاخص بلورینگی (کریستالینیته) خمیرکاغذها در طی مرحله بازیافت اول توسط ATR- FTIR افزایش این شاخص را در مقایسه با خمیرکاغذ دست اول نشان داد. در این تحقیق تغییرات طول الیاف در طی فرآیند بازیافت قابل توجه نبود. با توجه به نتایج می‌توان استخوانی شدن را یکی از دلایل اصلی افت کیفیت کاغذهای بازیافتی بشمار آورد. از سویی، کاهش میزان گروه‌های اسیدی می‌تواند یکی دیگر از دلایل کاهش در میزان ماندگاری آب و مقاومت خمیرکاغذ با بازیافت باشد. 1- Akerholm, M., Hinterstoisser, B., Salmen L., 2004. Characterization of the crystalline structure of cellulose using static and dynamic FT-IR spectroscopy. Carbohydrate Research 339,569–578. 2- Atalla, R. H., 1992. Structural changes in cellulose during papermaking and recycling. In: Mat. Res. Soc. Symp. Proc. Vol. 266, pp. 229-235. 3- Barzyk, D., Page, D.H., Ragauskas, A., 1997.Acidic group topochemistry and fiber-to-fiber specific bond strength.Journal of Pulp and Paper Science 23(2), 59-61. 4- Bovin, A., Hartler, N., Teder, A., 1973. Changes in pulp quality due to repeated papermaking . Paper Technol. 14(10): 261-264. 5- Brancato, A., 2008. Effect of progressive recycling on cellulode fiber surface properties. Ph.D. thesis.Georgia Institute of Technology, 147 pages. 6- Forsstrom, J., Andreasson, B., Wagberg, L., 2005. Influence of pore structure and water retaining ability of fibres on the strength of papers from unbleached kraft fibres. Nordic Pulp and Paper Research Journal 20(2): 176-185. 7- Guo, J.W., Wang, Y.,Quan,W., Wen, M., 2011. Effects of slushing process on the pore structure and crystallinity in old corrugated container cellulose fibre. Carbohydrate Polymers 83. 1–7. 8- Han,Y., Lanouette.R., 2008.Peroxide modified Jack Pine TMP. BioResources 3(3):870-880. 9- Hashemi, M., Hamzeh Y., 2010. Recycling potential of chemical pulp fibers from juvenile wood and mature wood of Poplar deltoides. M.S. thesis. 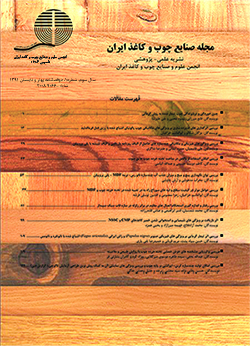 Department of Wood and Paper Science and Technology, university of Tehran, 80 pages,(In Persian). 10- Howard, R., Bichard, W., 1992. The Basic Effects of Recycling on Pulp Properties. Journal of Pulp and Paper Science 18(4): 151-159. 11- Hubbe, M., Rojas, O.J., Venditty, R.A., 2007. What happens to cellulose fiber during papermaking and recycling. Bioresource 2(4):739-788. 12- JinQuan, W.,Yan, W., Qing, X.,. 2010. Effects of hemicellulose removal on cellulose fiber structure and recycling characteristics of eucalyptus pulp. Bioresource Technology 101(12): 4577–4583. 13- Jin Kim, H., Soo Oh, J., Muk Jo, B., 2000. Hornification Behaviour of Cellulosic fibers by Recycling. Journal of Applied Chemistry 4(1): 363-366. 14- Matsuda, Y., Isogai, A. Onabe, F., 1994. Effects of thermal and hydrothermal treatments on the reswelling capabilities of pulps and papersheets, Journal of Pulp and Paper Science. 20(11): 323–327. 15- Nazhad, M. M., Pazner, L., 1994. Fundamentals of strength loss in recycled paper. TAPPI Journal 77(9): 171-179. 16- Nazhad, M. M., 2005. Recycled fiber quality. A review, J. Ind.Eng. Chem 11(3):314-329. Kewin, l., Jacques, l., Jinying, V., 1996. Effect of recycling on papermaking and high yield pulps.TAPPI journal 79(3):167-172. 17- Park, S., Venditti, R.A, Jameel, H., Pawlak, J., 2006. A novel method to evaluate fibre hornification by high resolution thermogravimetric analysis. Appita Journal 59(6): 481-485. 18- Richter, U. , 1991. Strukturanderungen von Cellulose durch Alkali Behandlung: physikalissche und chemische Beurteilungsmethoden. Doctoral thesis, Darmstadt University. 19- Sheikhi, P., Talaeipour,M., Hemasi,A., Eslam,H., Gumuskaya,E., 2010. Effect of drying and chemical treatment Bagasse soda pulp properties during recycling. Bioresource 5(3):1702-1716. 20- Takauki, O., 2002. The effet of recycling on pulp and paper properties. Japan TAPPI Journal 56(7): 986-992. 21- Tze, W.T., Gardner, D.J., 2001. Contact Angle and IGC measurements for probing surface-chemical changes in the recycling of wood pulp fibers. Journal Adhesion Science Technology 15 (2): 223–241. 22- Weise, U., Paulapuro, H., 1999. Effect of drying and rewetting cycles on fiber swelling. Journal of Pulp and Paper Science 5 (25): 163–166. 23- Wistara, W., Young, R. A., 1999. Properties and treatments of pulps from recycled paper .Part I. Physical and chemical properties of pulps, Cellulose 6:291-324. 24- Zheng, D., 2007. The Investigation of Carboxyl Groups of Pulp Fibers during Kraft Pulping, Alkaline Peroxide Bleaching, and TEMPO-mediated Oxidation. Ph.D Thesis, School of Chemical and Biomolecular Engineering Georgia Institute of Technology.